This week without school has been reasonably productive and saw me actually sorting my CV out and sending it off to some English teaching schools – within a few hours I got a call from one of them in Jesi to say that they wanted me to come in for an interview. I had the interview on Friday. 1: The first bus was late (Annoyance Factor: Irritating. But to be honest, my expectations had already been set – the bus has never been on time and this is exactly what the contingency time was for). 2: The published timetable for the next bus I needed to catch from Ancona was wrong. The buses did not run every half an hour as stated but at a random frequency which was on average every one and a half hours with an exceptionally long gap in the morning that I had not accounted for. The published timetable didn’t indicate what bus I needed to take either – or from where – but see Item 3 below. (Annoyance Factor: Annoying). 3: The published bus routes were wrong. Having lived in London for a good portion of my life, I feel confident in telling you that I’ve nailed buses. I pulled upon this extensive knowledge and read the bus stop sign / misleading trap (see “Exhibit A” below) with a list of destinations and thought, ah “This bus ‘I’ is going from here to Jesi”. I was pleased. It’s unusual here that there’d be a sign clearly denoting the buses and where they go. When the bus eventually came, decades later, the bus driver informed me that his bus ‘I’ does not actually go to/anywhere near Jesi. Why? I don’t know, the kind and informative bus driver offered no explanation (Annoyance Factor: Really Really Very Annoying). Exhibit A: I know it’s fuzzy. Squint a bit and pretend it’s one of those magic eye pictures – Bus “I” goes from Ancona to Jesi. This was taken from the bus stop where bus “I” was due and to give them credit, eventually did, arrive at. 4: Even the bus stop itself which said that the buses from there went to Jesi was a trap. It emerges, only through speaking to multiple other people / victims, that I should have waited at The Secret Bus Stop further down the road that had no sign or timetable or indeed little indication that it was actually a bus stop. Why would the bus company go to such extravagant lengths to lure people into waiting HOURS in the wrong place for the wrong bus?! WHY?!?!?!?!?! Well I’ll tell you why (see Item 5 below. Annoyance Factor: Livid making). 5: Ancona Train Station is large – there are a lot of bus stops, particularly when Secret Bus Stops are taken into account. It really does warrant someone from the bus company being there for information, even if it was to support their Mission Statement which must start with “We are committed to ruining people’s lives…”. What a lost opportunity! They could have been at the station in person to direct innocent people to imaginary bus stops and tell them to wait for imaginary buses all day! (Annoying Factor: Ugh, Annoying). 6: And another thing…Whether it was because I’d be waiting at the wrong bus stop, waiting for the wrong bus or because the timetable was wrong, I don’t know, but I stood waiting for almost 2 hours in searing heat with no shade and no seats. I believe the Mission Statement continues with “…and by the end of Summer 2013, we hope to have played a key part in reducing the world’s overpopulation crisis by indirectly causing the deaths of thousands that attempt to use our buses through severe exhaustion, heat stroke and complications from fat, bloated ankles”. (Annoyance Factor: Too Exhausted and Depressed To Even Be Annoyed Anymore). 8: That was the end of the public transport saga. Is anyone still reading?! Onto sat nav… 🙂 When I got to Jesi eventually, believe it or not, I still had plenty of time to find where the interview was. That was until my sat nav on the phone decided to stop working. But not in the sense that it wouldn’t turn on. No, I mean in the sense of creating a destination road miles away which never materialised (hmm, perhaps the sat nav app was created by Ancona’s bus company?). I checked numerous times that I’d entered the correct details and not “end of the rainbow” / “horizon”. I almost walked back out of Jesi before giving up and checking on Google Maps. And let me tell you, Google, who make it their business to know everything about everyone and every place in every location that there ever was, had no record of this road that the school was on (even though it did the day before!). Its destination pointer kept pointing to another random road miles away in the opposite direction. Devoid of hope, tired, hot, sweaty, with aching feet, I headed there. And success! 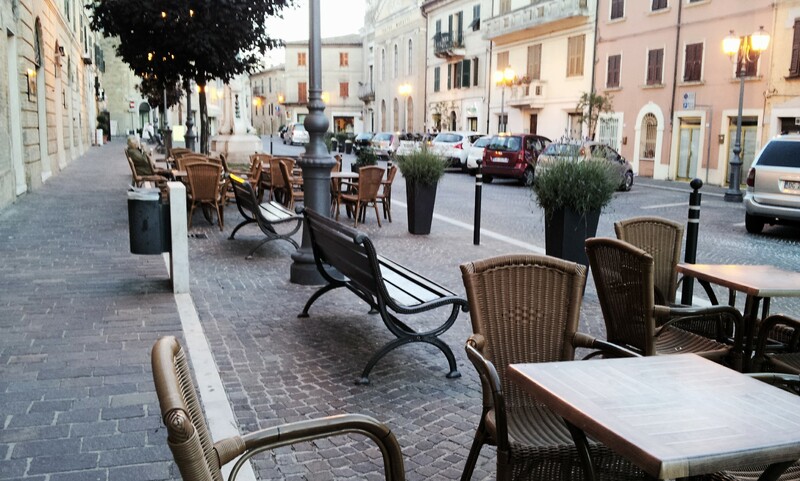 After an hour or two walking the streets of Jesi I arrived! (Annoyance Levels: Livid, offset marginally by sheer joy of finding the place after so long). 9: Looking around me when I got outside, I spotted some familiar buildings. I estimate the school where the interview was, was about 20 meters away from where the bus originally dropped me off. (Annoyance Level: See Basil Fawlty at the end of Waldorf Salad episode). Anyway, I dug deep, visited my happy place and instructed myself to be cool, calm and collected for the interview which went well. The interviewer was a woman that had moved out to Italy a few years ago and loved it. Very nice and friendly. My cool, calm, collectedness lasted for a minute or two until she asked me if I’d got there ok! It’s probably an interview faux pas to launch into how impossible it is to anywhere to the office where you’d be working but regardless, she said that I had the right communication skills and personality to work there. Aw. My lack of experience wasn’t an issue. However, they’re a good school and have standards (standard schmandards…) and if I wanted the job, I’d have to commit to doing a CELTA course (despite my other TEFL qualification) which would cost about £1k, take a month of intensive study to do in somewhere that’s nowhere near here. And they only employ people with cars or that live close by (Yup. I would readily gauge my own eyes out with a rusty spoon before doing that journey again). I knew pay was less here, that unemployment is a massive issue and that teaching jobs aren’t well paid in general but the salary is terrible! I wouldn’t have thought it possible to survive on such a low income here. I’ve checked and what they’re offering is pretty average. The cost of living here compared to the UK is pretty similar to be honest but the salaries are at least 2 or 3 times less for the equivalent job in the UK. Anyway, I’ll think about it. It was left that “we’d keep in touch”. To be honest, I was looking for something on a more part-time / when I want to do it basis. I don’t really like working. My quest for an inscrizione dei cittadini stranieri (step towards residency goes on) – I’ve finally got a letter from the school to say that I’m a student there. I’ll attempt to go in to the Comune… (I should check how you’re pronouncing Comune – it’s “koh-moon-ay”, not “com-yoon”. It’s not a communist working camp. Ha! “Work”! Imagine! Yeah, it’s definitely not one of those)… on Monday to see if I can get the ball rolling again. I heard a rumour from someone yesterday that I didn’t actually need to be here 3 months to get a car so I’m going to start looking into that next week too. Does anyone have any opinion on what car I should get? I want to pay the least possible for a second hand one that is reliable, that uses diesel (it’s cheaper here) and that’s cheap to insure and tax. Answers on a postcard (or at end of blog!). I’m still looking for an apartment too – I saw the neighbour’s apartment last Sunday which he’s going to be renting out in September. 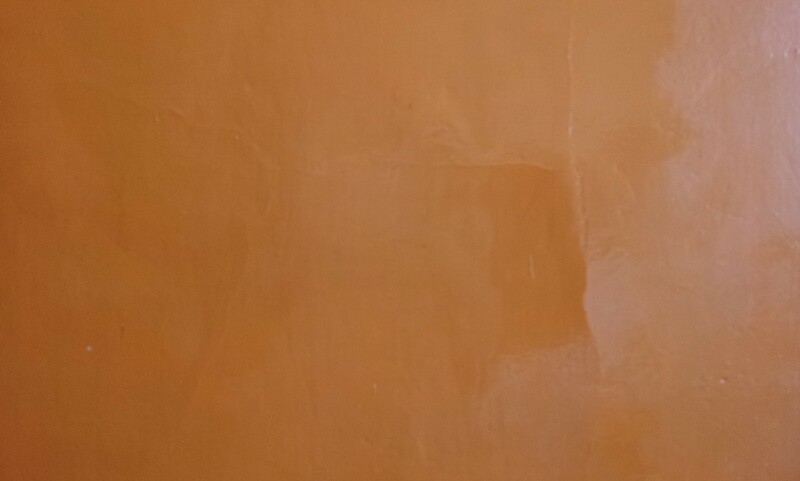 It’s just opposite the road from here with two bedrooms but a really small kitchen, with no outside space and newly decorated in Diarrhea Brown (a curiously popular shade here in houses). I finally caught one of the estate agents whilst the office was open (it’s been shut continually for what seems to be the entire time I’ve been here). Despite hearing rumours that it was indeed a working office, I thought it must have closed down. But no, no… Anyway, he was a lovely man, said how good my Italian was for the time I’ve been here (my definition of “lovely”: someone that compliments my Italian. Which is interestingly the same definition I have for “barefaced liar” 😉 ). There are apparently 3 potential apartments close by – all unfurnished though. I’m hoping to have a look at some of them soon – he said he’s going to call me. He hasn’t yet. I suppose that’s one of the inevitable hall marks of being a lovely, barefaced liar. I have three new housemates – a woman from Austria, another from Russia and her friend (male) from Italy. They’re all are very friendly. I think we’ll get on. I went out with the Austrian to a couple of the local bars when she arrived on Friday and had a lot of fun. We spoke in Italian the whole time so that was good – it’s great to have someone to speak Italian to at home at a sort of conversational level. Almost two months in, I remain constantly surprised that other people can understand what I’m saying: in the same way Euros seem like monopoly money to me, other languages seem like a childhood secret code (albeit a frustratingly difficult and grammatically challenging one). I had to move bedrooms – my old bigger one had been booked out by one of the others but I’m happy with the smaller one – it’s much cooler. The new bedroom… There’s another window on the wall where the wardrobe is so I get a draught which is really nice. I was almost comfortable last night as opposed to sweltering. What else? 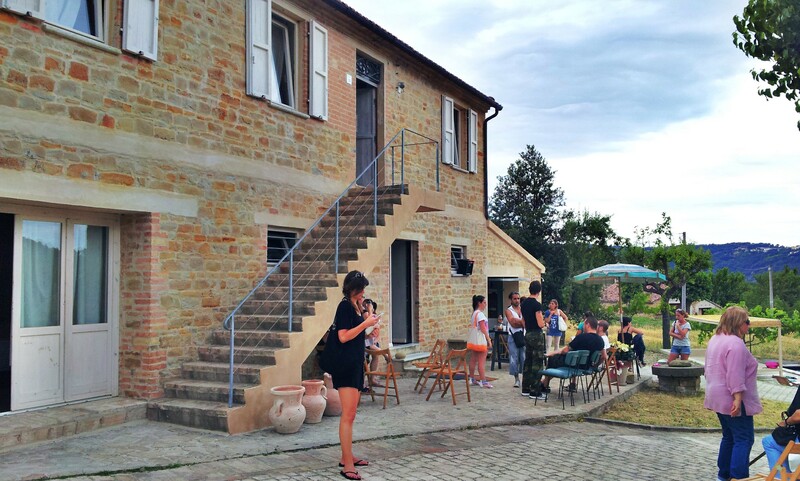 I went to an Agriturismo opening party yesterday – free food and drink! For people that haven’t heard of them, Agriturismo’s are usually B&B affairs set in countryside and often with some kind of working element to it whether it’s a vineyard, olive grove or something more ‘farm like’. This place was a renovated farm house I think (it had handy hooks for your dead pigs in one of the downstairs bedrooms…. I have to keep mine in the wardrobe) which was split into 3 lovely apartments. Friends / family: rather than stay with me for free, I recommend you pay for yourselves (and me) to stay in this agriturismo. It’s lovely. And there’s not even a hint of Diarrhea Brown. The Agriturismo – It was a unique marketing event. I don’t know what it’s called. Or really where it is. Or what it costs. There’s no website, brochures of any kind or discernible ability to book…Yet, it was really nicely done and had a beautiful swimming pool. I like it a lot. People should definitely go there. If they can find it. I jest, I think I could probably find out if people actually were. I missed out last week’s “What’s a bit odd” (well noticed Pete) so was going to make up for it now with two (infinite stock to chose from) but there’s a *chance* I may have ranted earlier rather than use the blog to provide a semi-useful Italian moving guide as was the intention. I apologise but it’s been therapeutic and might reduce the need for counselling at a later date. So I’ll keep it at one: Dress Sense. The Italians are known for good dress sense eh? They’ve got Gucci, Prada, Armani, Dolce & Gabbana… But here, back in real life, people’s dress sense only falls into two categories: 1) Bog Standard (I like to consider myself in this group) and 2) Dire. I’ve seen men wearing lime green or pink chinos with little girl vest tops and shiny long pointy shoes… I’ve seen women wearing skin-tight (tighter even) fluorescent numbers with colour coordinated giant earrings and impossibly high shoes that could probably be classified as stilts… Well, there are many examples and I can only apologise that to date, I’ve been too slow to get my camera out. And I say “dire” in the kindest possible sense. I know everywhere has a few er, uniquely dressed people. I think it’s fabulous that people explore their personalities through fashion and it must take an admirable amount of courage to leave their houses like they do wearing what they’re wearing. So this week’s “what’s a bit odd” is only to say that the ratio of Dire to Bog Standard is definitely higher here on the Dire side than elsewhere I’ve been. Along with beautiful countryside, historic and magnificent cities, quaintly picturesque towns, spectacular coastline and amazing food; dress sense is just another reason I like Italy so much. It makes me smile. Other news – I’ve bought a snorkel! I’m stupidly excited about it. I’ve been writing this in the kitchen patiently waiting for passing-by housemates, hoping to recruit a Bag Guard for on the beach so that I can snorkel without the fear of becoming destitute if someone steals it. Alas, it’s mysteriously quiet. I might have a go in the bath. P.S. Here’s a photo from the “event” the piazza I mentioned I might go to last week. Sponsored “stay at home” event? The nightmare journey does ring a bell with us – we had issues in Sicily with some no-shows, and a hairy wait to see if the Catania Airport bus would finally turn up, or should we get a 12 Euro taxi to the airport (we finally made it with our cheap bus ticket). The buses in Napoli did exist but were seriously overcrowded, the metro can’t be finished there quickly enough! Love the photo of the event! Will think about the agroturismo. . . . .
Sicily is fantasic, for a strange experience go by train – they split the the Palmermo and Siracusa sections and put the carriages on the train, you can then go on deck for the half hour or so crossing before getting back on and getting the train along the coast. I think there’s only one other place in Europe they still do this (Denmark?). Once you’re back on the train the journey is a bit slower than on the mainland. It’s not the quickest way, but definitely a bit odd. It’s great watching Inspector Montalbano episodes after you’ve been to the area!